An ATM Dehumidifier? What are you talking about? machines in our fleet, we did the same thing you do. We dug out our checkbooks and paid the repair bill. Sure, we grumbles a little, but it’s just the cost of doing business in our industry, right? Everyone who has ever owned even a small number of ATMs has experienced this. What if… Two little words that have often started big things. What if we didn’t have to accept that there will just be a certain percentage of downtime for our ATMs? What if I didn’t have to pay hundreds of dollars to a security company to make my machines accessible and safe for a repair tech, who I also have to pay? What if I didn’t have to get frustrated when the same problem happened again just a short time later? These are the questions we set out to find solutions for. We examined the problem from many angles and came up with the “what if” question that we surmised might be the key. What if many of the problems are a function of high humidity? As you might have guessed by now, we discovered after months of testing, that our hypothesis was correct. High relative humidity (RH) was indeed the villain. Let’s explore how we arrived at this conclusion and how we solved the problem. What does the term “Relative Humidity” mean? Let’s start with an explanation of the relationship between temperature and humidity in layman’s terms. The term Relative Humidity (RH) refers to how much water vapor is in the air, compared to how much it could hold relative to the temperature. It is shown as a percentage. For example, if the RH level is 50%, it means the air is holding one-half of the water vapor it is capable of holding if the temperature doesn’t change. If the amount of moisture in the air doubled, the RH would be 100%. Remeber, this is all dependent on the temperature. If the temperature changes, so will the relative humidity. You will see how this is important later. Relative humidity and temperature have an inverse relationship. When one goes up, the other goes down and vice versa. So, if the temperature goes up, the humidity goes down. This is because warmer air can hold more water vapor. The opposite is also true. When the temperature goes down, the relative humidity goes up. If high RH is our problem, how can we fix it? The obvious answer to the question is to lower the relative humidity. But how do we do that inside an ATM? There are several ways to lower humidity. The first, and seemingly most obvious way, is to physically remove water vapor from the air. This involves the use of a room dehumidifier that removes water molecules from the air. Everyone has seen this type of appliance. They are readily available at any hardware store and are often used in damp basements. A tub of desiccant can also achieve this in some situations. The second way is to increase atmospheric pressure. Yes, this is as difficult as it sounds, so we’ll essentially ignore that approach. The third way, as mentioned above, is to raise the temperature of the air. To do this you need some kind of small heating device that fits inside the ATM and is safe to use around currency. This is where the Guardian Rod comes in. Let’s do a side by side comparison of the first and third approach and try to determine which method is more suitable for our intended purpose. It seems logical that removing water molecules from the air will reduce relative humidity. If this approach will solve our problem, all we should have to do is find a small home dehumidifier, set it up inside the ATM, and plug it in. It will remove moisture from the air and in no time, we have a trouble free machine. Or, for less money up front, we could get a tub or bag of desiccant and set it inside. After all, when the ATM was new the manufacturer shipped it with desiccant inside. The desiccant will draw excess moisture out of the air, again leaving us with a fully functioning ATM. While both of these methods do indeed remove moisture, do they solve the problem in our situation? Unfortunately, the answer is simply no, they do not solve our problem. Removing water vapor from the air will lower RH, but only in a sealed or nearly sealed environment, like when the new ATM was delivered wrapped in plastic. The problem with trying to remove the molecules of water from the air is there is so much air and so many water molecules in it. Attempting to remove moisture from the atmosphere is like scooping a cup of water from the ocean and expecting to notice the difference in the level. As soon as we remove a bit of humidity, more comes in right behind it to fill the void. Largely, belief in this approach to dehumidifying is based on the visible evidence of water in the container. An actual check of the relative humidity level reveals very little change. If the amount of moisture in the air stays the same and the temperature increases, the relative humidity decreases. How do you raise temperature in an ATM? 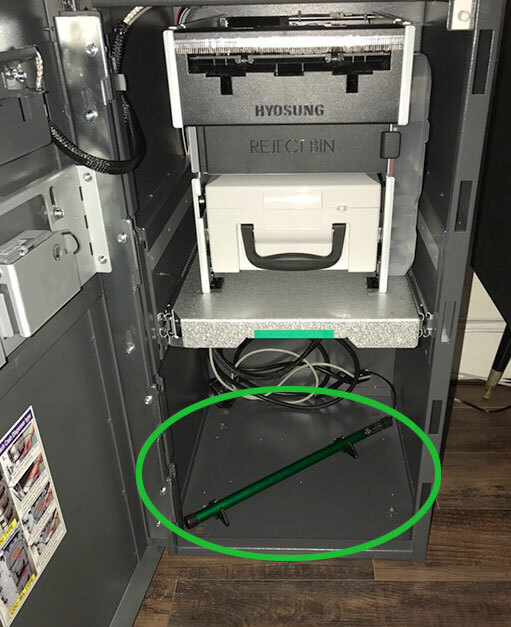 The Guardian Rod is a small, self-contained heating rod that sits in the bottom of an ATM where it warms and circulates the air inside it. It uses electrical resistance to create warmth and is double insulated to keep your currency completely safe. As the air at the bottom of the ATM is warmed, it naturally rises, passing the currency in the cash cassette and eventually finding it’s way out through the myriad of small openings in the upper parts of the machine. As the light, warm air exits out through the upper openings; cooler, damp air finds it’s way in through the lower parts of the ATM and is warmed by the Guardian Rod. The ATM electronics, rollers, belts, and currency inside have a constant gently moving supply of warm, dry air. dehumidifier needs to happen manually which means having to open the ATM on a regular basis, perhaps even daily or figure out a way to drain the water reliably. The desiccant is generally about $10 per tub which will last about a month. This will add up over time. The cost of paying a security company to open the ATM for service can be high. You must be present to service the dehumidifier or desiccant. Contact with the salt crystals, whether wet or dry, must be avoided. They pose a health risk to pets and children. Spilling the spent desiccant in the ATM will lead to severe corrosion of the metal, necessitating expensive repairs. Spilling the desiccant will result in a constant wet spot wherever it was spilled. Clean up is no fun either. The evidence is clearly overwhelming that the Guardian Rod is much simpler to use, more cost-effective in both the short and long term, and it carries no risk to the ATM owner. Is it really possible that something so simple can work this well? Is it truly a plug it in and forget it solution to the problem? Keep reading to see the results of our testing and experimentation.